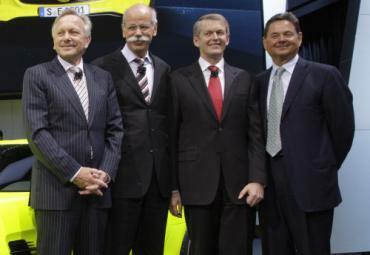 Ernst Lieb (shown on the far right of the image to the right) was removed from his position in October with the company stating that it was due to Lieb’s misuse of company funds to upfit his home. Lieb’s lawyer Stefan Naegele claims that his client did not misuse any funds but instead, the $100,000+ that Lieb spent on the company-owned home was required maintenance. The items specifically mentioned in discussions about Lieb’s firing were a high end home theater system, a new washer and dryer, a built in barbecue system and a home gym. However, Naegele claims that these expenditures were approved by Daimler facilities management divisions, pointing out that the gym was refurnishing after sustaining water damage and the washer/dryer were replaced because they were in disrepair. Mind you, the Mercedes Benz owned New Jersey home is worth an estimated $1.4 million so you have to wonder just how bad the items that Lieb replaced really were when they weren’t good enough for him. Daimler began the audit of their overseas executives and in doing so, found fault with quite a few of their now-former executives’ use of the company expense accounts. Mr. Naegele represents several of those fired bosses and in short, it seems that his argument is that “everyone was doing it” so his clients shouldn’t have been fired but considering that all of his clients were doing it and all of them were fired – it could be tough for Mr. Naegele to convince a court that his clients were removed unfairly. However, the fact that Ernst Lieb was using company funds to dress up a company-owned house with expenses previously approved by the company could give Lieb’s legal counsel a leg to stand on. Ernst Lieb served as the CEO of Mercedes Benz USA for five years before being ousted over the alleged misuse of company funds and earlier this month, Daimler announced that 50 year old Mercedes marketing boss Steve Cannon would assume the role of CEO of MB USA. Head-Rest screen in ML Mercedes. Mercedes - no one can answer.